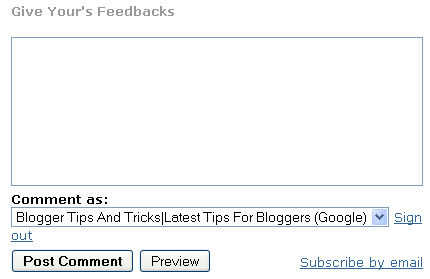 You can see "Post a Comment" text above your comment form in blogger.If you like to replace this "Post a Comment" text with your own creative text follow the steps below. Note : You can find above code in 2 places. 4.Now replace above codes with your own text.For example I replace it with "Give Your's Feedbacks". 5.Now save your template and you are done.Refresh your site to see result.It will look like above image. Now that you have your topics in place, it is time to begin blogging. When you are blogging for the purpose of marketing, you want to give your readers something that they have to keep coming back for. Pretty nice place you've got here. Thank you for it. I like such themes and anything that is connected to them. I would like to read more soon. Useful information but some time it does not work well i do not know why?but if i change the explorer it works.by the way thanks for information. Hey, nice post. I always wanted to change the text in my blogger website. excellent tutorial blog psot.its useful & educational. very good tips, I dont know. Thanks very much, good tips! Thank you for this tip. It is useful if I have a blog other than English. 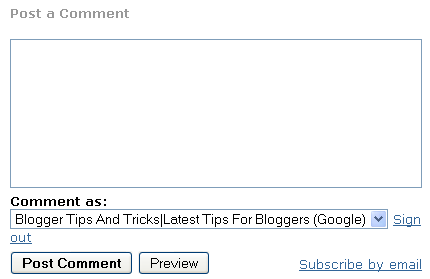 Thanks bro for this blogger customization tips, the reason why I want to change the post a comment with post title is SEO. I keep on looking and reading for your new post.